Valentine’s Day is fast approaching. With Valentine’s Day comes the Valentine’s Day classroom party. Which means last minute requests from my kid to bake something. This year I am prepared with a super simple and festive Valentine’s Day popcorn. I love party popcorn. 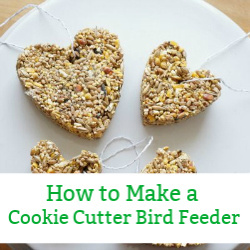 It is so stinking easy to make. Seriously! 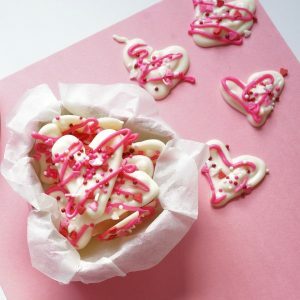 Head to your local bulk food store and stock up on all the cute Valentine’s day sprinkles and chocolates and have some fun. 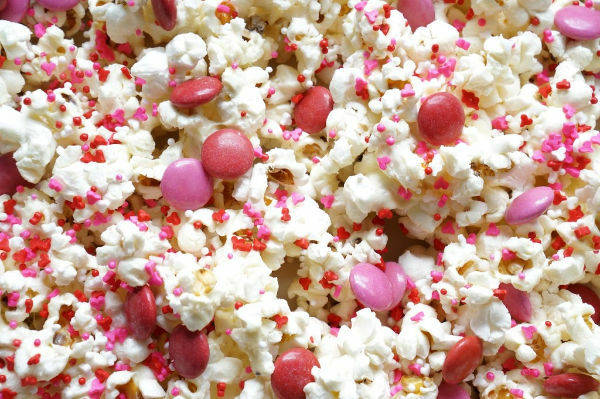 Skip the cupcakes and cookies and go with party popcorn this Valentine’s Day. It is perfect for school parties. 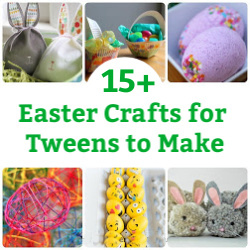 Especially if you make little treat bags for each kid. This way the treat can be eaten in class or taken home to enjoy. Start by making the popcorn. If you are going to use microwave popcorn (I don’t have a microwave) make sure the popcorn is not butter coated. The buttery coating will impact the ability for your melted chocolate to stick to the popcorn. You will need 2 bags of microwave popcorn for this recipe. If you opt for stovetop popcorn, place the popcorn kernels in a lidded pot, heat 2 tbsp vegetable oil and 1/3 cup kernels over medium high heat. Don’t close the pot tightly, keep the lid open a little. This will let the steam out. Put oven mitts on and start to shake the pot as the kernels begin to pop. Keep shaking the pot until all of the popcorn is done popping. When you hear the kernels slow down, turn off the heat. Open the lid and sprinkle a little salt onto the warm popcorn. Pour the popcorn into a large bowl and let it cool. Now for the chocolate. Again, you can use a microwave for this step. Simply place the chocolate chips in a microwave safe bowl and melt in the microwave for 20 seconds at a time – stirring after 20 seconds. Continue heating and stirring until the chocolate is completely melted. For those of us without a microwave, it is pretty easy to melt chocolate on a stovetop. Place the chocolate chips in a heat proof bowl over a pot with boiling water. The water in the pot should not touch the bottom of the bowl with the chocolate in it. Stir the chocolate chips until they are melted. This will happen quickly, so stay with the bowl and continue stirring. When the chocolate is melted, remove the bowl from the pot and dry the bottom of the bowl. Now, move quickly. Use a spatula to scrape the melted chocolate over the cooled popcorn. It might be a little clumpy, that’s okay. Use a big spoon to stir the chocolate into the popcorn and all of the popcorn will be coated with the chocolate. 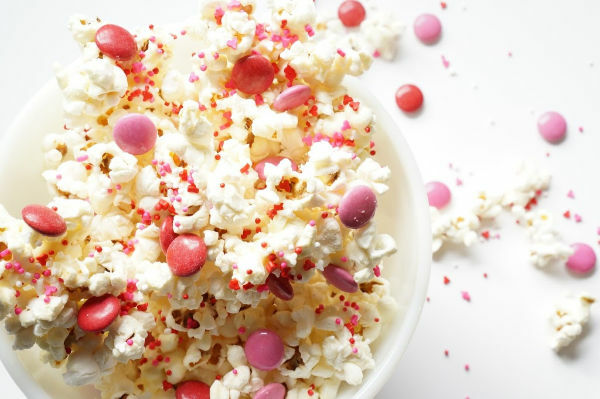 Pour the chocolate coated popcorn onto a parchment paper lined baking sheet and while the chocolate is still hot and sticky, sprinkle the popcorn with all of the other the toppings. The warm chocolate is the glue that will help the sprinkles and candy coated chocolates stick to the popcorn. Now set aside the popcorn to cool and firm up. 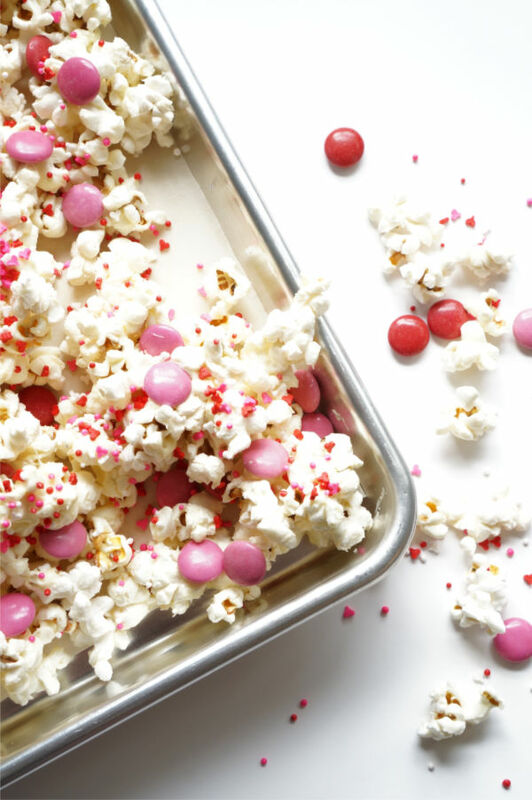 Once cooled, the Valentine’s Day popcorn can be served in a big bowl or scoop individual servings into clear plastic bags and to be handed out to friends on Valentine’s Day. 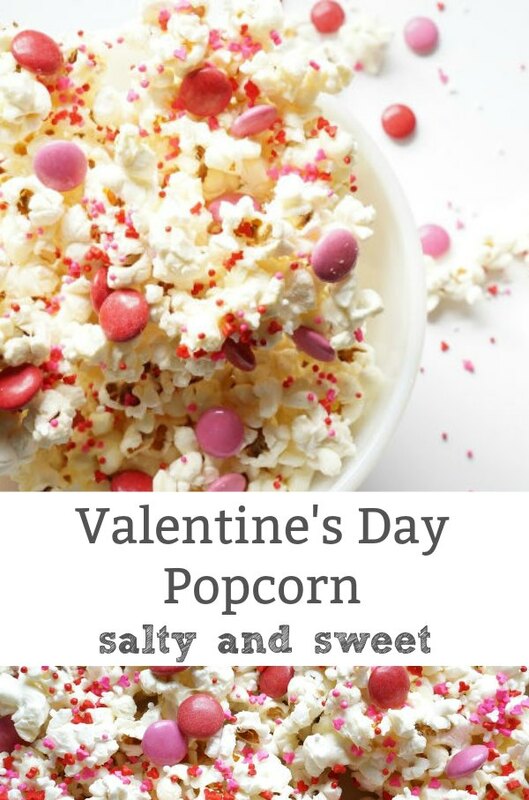 Valentine's Day popcorn is the perfect sweet, salty and chocolatey treat to make for any Valentine's Day party. 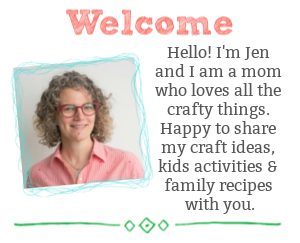 So simple to make and everyone loves popcorn! Start by making the popcorn. If you are going to use microwave popcorn (I don't have a microwave) make sure the popcorn is not butter coated. The buttery coating will impact the ability for your melted chocolate to stick to the popcorn. You will need 2 bags of microwave popcorn for this recipe. 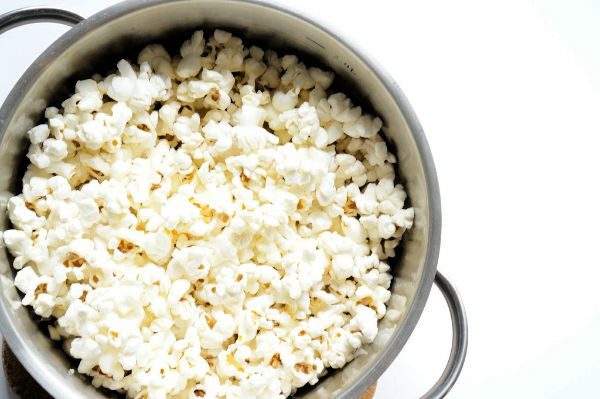 If you opt for stovetop popcorn, place the popcorn kernels in a lidded pot, heat 2 tbsp vegetable oil and 1/3 cup kernels over medium high heat. Don't close the pot tightly, keep the lid open a little. This will let the steam out. Put oven mitts on and start to shake the pot as the kernels begin to pop. Keep shaking the pot until all of the popcorn is done popping. When you hear the kernels slow down, turn off the heat. Open the lid and sprinkle a little salt onto the warm popcorn. Pour the popcorn into a large bowl and let it cool. Now for the chocolate. Again, you can use a microwave for this step. Simply place the chocolate chips in a microwave safe bowl and melt in the microwave for 20 seconds at a time - stirring after 20 seconds. Continue heating and stirring until the chocolate is completely melted. Now, move quickly. Use a spatula to scrape the melted chocolate over the cooled popcorn. It might be a little clumpy, that's okay. Use a big spoon to stir the chocolate into the popcorn and all of the popcorn will be coated with the chocolate. Pour the chocolate coated popcorn onto a parchment paper lined baking sheet and while the chocolate is still hot and sticky, sprinkle the popcorn with all of the other the toppings. 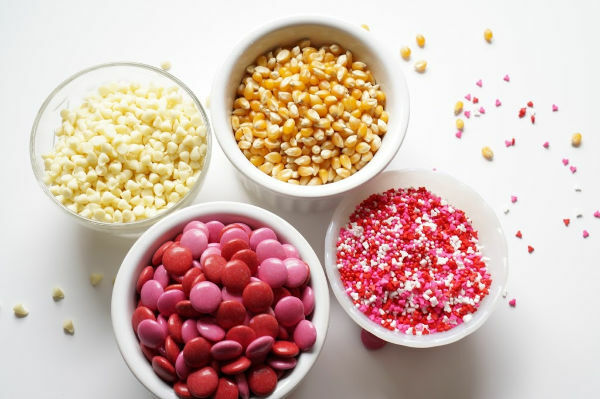 The warm chocolate is the glue that will help the sprinkles and candy coated chocolates stick to the popcorn. Now set aside the popcorn to cool and firm up. 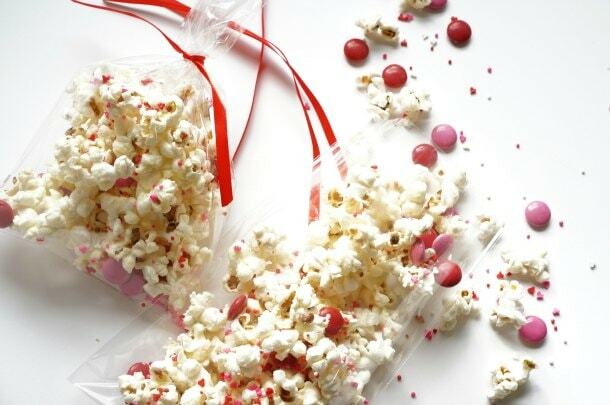 Once cooled, the Valentine's Day popcorn can be served in a big bowl or scoop individual servings into clear plastic bags and to be handed out to friends on Valentine's Day. Nutrition info is to be used as a rough guide only. Nutrition info is based on the products I am using, you may not be using the same brands/products. Thus, the nutrition info may vary. 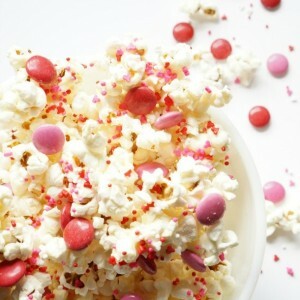 What will you add into your Valentine’s Day popcorn? 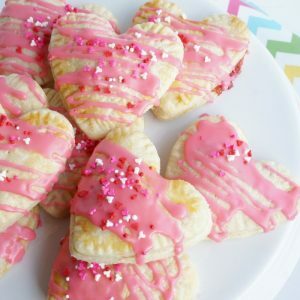 Be sure to follow our Valentine’s Day Crafts, Activities and Recipes Pinterest board for all kinds of inspiration.